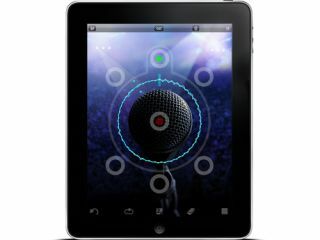 NAMM 2011 PRESS RELEASE: TC-Helicon, the only pro audio company 100 percent dedicated to the needs of vocalists, announces the VoiceJam app - a powerful iPhone, iPod Touch and iPad app for creating music on the fly. The application provides real-time audio looping, layering and an intuitive live performance interface to musicians everywhere. The portability of the iPhone and iPad allows musicians to be creative with the sounds around them, wherever they go. Despite its name, VoiceJam is not limited to the voice - if it's audible, it's loopable! VoiceJam uses the iPhone, iPad, or iPod Touch 4th Generation's built in microphone, or any external microphone, to record and layer sound onto an evolving loop. Loops are evolved by layering new audio ideas in sync with older ideas that gradually fade away. Loops can also be copied and swapped in and out of six alternate loop locations, allowing a complex musical structure to develop over time. A final performance recording can be uploaded to the popular SoundCloud online music network. "Traditional audio loopers constrain you to a single loop. While they often make it easy to build up a great phrase with each new layer, they never make it easy to go anywhere with the original idea," states Tom Lang, TC-Helicon product manager. "VoiceJam encourages you to expand your range of vocal capabilities, giving you the tools to create a complete musical performance with all the dramatic structure of a fully mixed composition. It's not about toying with small ideas, it's about creating something truly great from the ground up." VoiceJam has its very own audio narrated and interactive tutorial which provides a step-by-step guide, giving real-time interactive demonstrations of how to start jamming with VoiceJam's intuitive and creative interface. In addition, it has its own 'performance recorder' where everything coming into the microphone and all looping actions are recorded and saved into an exportable audio recording. Performance recordings can be uploaded to SoundCloud for the whole world to enjoy.